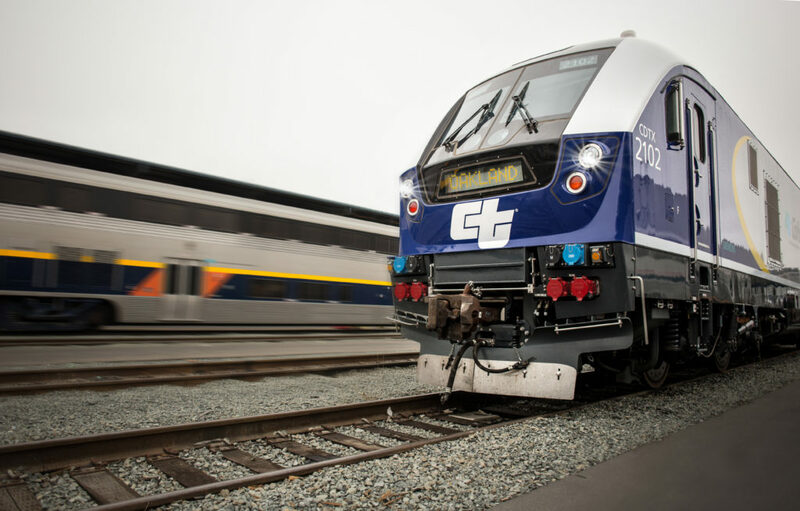 The Capitol Corridor Joint Powers Authority (CCJPA) is one of 28 agencies selected for projects to reduce greenhouse gas emissions by expanding commuter and intercity rail. On April 26, 2018, the Capitol Corridor Joint Powers Authority (CCJPA) received notification from the California State Transportation Agency (CalSTA) that it received $80,340,000 million in grants made possible by the Transit and Intercity Rail Capital Program (TIRCP). The CCJPA was among 40 entities statewide that applied for the funding in February 2018, and is one of 28 entities that received a share of the program’s total $2.6 billion made possible through Senate Bill 1 (SB 1), as well as proceeds from the Cap and Trade program. The multi-year program provides funding for projects aimed at reducing greenhouse gas emissions and creating jobs by expanding transit and rail options that are faster, more frequent, and more reliable. The CCJPA’s total award of $80,340,000 will support projects under its Northern California Corridor Enhancement Program, with a total budget of $275,041,000 and an expected GHG reduction of 1,348,000 metric tons of carbon dioxide emissions. Oakland to San Jose Project Phase 2A: This project proposes to reroute the Capitol Corridor trains between Oakland and Newark, with the proposed establishment of a new intermodal station linking Dumbarton transit services in the Fremont/Newark Area. This rerouting will reduce train travel time from the Oakland Coliseum Station to the Santa Clara-Great America Station to about 30 minutes, providing key service differentiation and access to new markets, such as schools and businesses in Silicon Valley, that parallel the congested I-880 highway corridor. Statewide Integrated Travel Program: Investment in statewide service and ticket integration, providing opportunities for riders on at least 10 rail and transit systems to plan travel and purchase tickets in a single, seamless transaction. This investment will lead to significant improvements in ridership, efficiency, and connectivity on rail and transit systems across California and will be developed with a framework that allows for rapid expansion following the pilot program to interested public and private sector partners. Partners of the CCJPA were also recipients of TIRCP funds. A number of those partner projects will complement the Capitol Corridor train service and contribute to overall transportation network improvements, such as safer grade-crossing and better bus-train connections. Read the official CalSTA press release about the TIRCP funding award and see the complete list of projects that received funding. The Capitol Corridor Joint Powers Authority (CCJPA) is the managing body of the Capitol Corridor. The Capitol Corridor is an intercity rail service connecting the most economically vibrant urban centers in the Northern California megaregion – from the Sacramento capital, to the tech hub of Silicon Valley, and including San Francisco, Oakland, and Berkeley. With a Café Car and free wi-fi on board, Capitol Corridor trains provide a convenient, reliable, and comfortable alternative to the congested I-80, I-680, and I-880 freeways for both work and leisure travelers. For details about the Capitol Corridor, visit www.capitolcorridor.org.